Electric Ireland will, again, be bringing a unique coffee experience to the Dublin Web Summit. Powered by Twitter, Dublin Web Summit delegates will be able to enjoy a nice break from the talks and schmoozing by ordering simply by tweeting. Following on from last year's extremely popular (and award winning!) 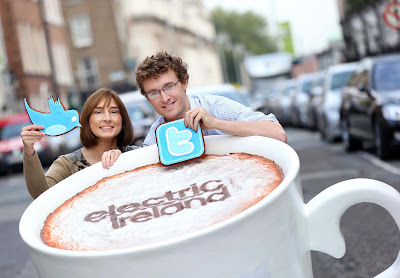 addition to the summit, Electric Ireland’s Tweet Café will have lots of little doors with numbers corresponding to various coffee orders so you simply tweet the hashtag (#TweetCafe) with your order number. An electronic queuing system will then let you know when your order is ready and you simply head to the door and pick it up. Beyond just the delicious coffee experience, the Tweet Café also provides delegates with an excellent opportunity to network with key speakers who will be available at the Tweet Café. Some of the speakers lined up include film director Barry Sonnenfeld, blogger Robert Scoble, Moshi Monsters’ Michael Acton-Smith and internet activist Wael Ghonim among others. Another highlight of the Dublin Web Summit is the Electric Ireland Spark of Genius Award, the winner of which will be announced at the Dublin Web Summit on October 18th 2012 with a prize fund worth €100,000. The competition, now in its third year, focuses on the most promising high potential startups. Nearly 1,000 entries have been shortlisted to 100, who will be offered an opportunity to pitch to leading international investors (Google Ventures, Andreessen Horowitz, Kleiner Perkins, Atomico, Accel and many others), industry leaders, startup experts at the Dublin Web Summit taking place at the RDS on the 17th and 18th of October. For information on the year’s Dublin Web Summit taking place on 17th and 18th October and to book a place visit www.websummit.net.